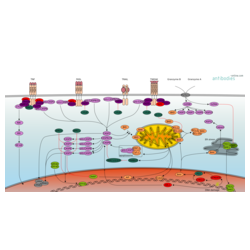 Programmed cell death or apoptosis is an important physiological process in multicellular organisms. The equilibrium between cell growth and division and the rate at which cells undergo cell death allows for dynamic adjustment of the cell number depending on internal or external parameters. For example, during the development of the vertebrate nervous system about half of the cells undergo apoptosis shortly after they have been formed. In an adult organism, this equilibrium is essential to maintain for example the size and function of organs and tissues. Dysregulation of this equilibrium oftentimes leads to cancer. Unlike necrosis which causes a potentially damaging inflammatory response after affected cells burst, apoptosis unfolds in a very organized way: the cell shrinks and condenses while the internal structures are disassembled and the DNA is fragmented. The dying cell is then rapidly phagocytosed by neighboring cells or macrophages. At the core of the apoptotic process are caspases, a family of cysteine proteases. They are produced as pro-caspases which are rendered active subsequently to cleavage by other caspases. This caspase cascade is triggered when initiator procaspases (e.g. procaspases 8, 9, 10) are aggregated with the help of adaptor proteins, thus facilitating mutual activation due to low protease activity or conformational changes of the procaspases. The activated caspases are then free to activate effector caspases (e.g. caspases 3, 6, and 7) and promote apoptosis. Their effect is further regulated by Bcl-2 family proteins (e.g. Bcl-2, Bcl-xL) and IAPs (inhibitors of apoptosis, e.g. BIRC1, XIAP). Apoptotic processes follow several pathways. Extrinsic death receptor pathways are induced through ligands that bind to a family of death receptor proteins (e.g. 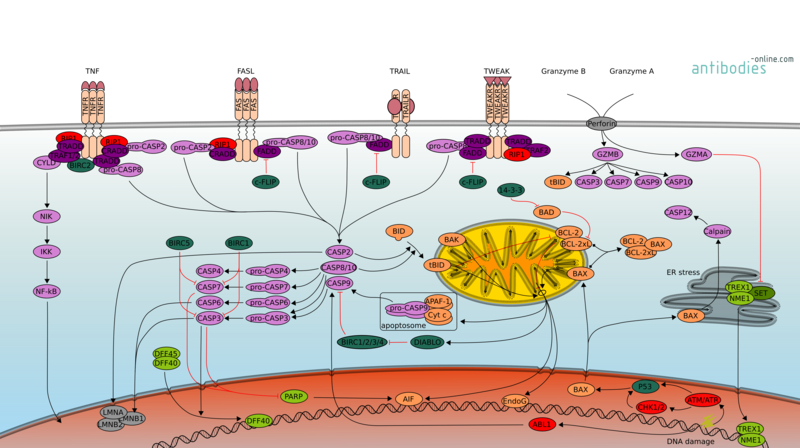 the FAS and TRAIL receptors) containing a cytoplasmic death domain. The intrinsic pathway is engaged in response to DNA damage or mitochondrial stress and is particularly relevant in cancer. Besides these canonical apoptotic pathways there are also caspase independent pathways, triggered e.g. by granzyme B and A. These caspase independent pathways are thought to have evolved in response to viruses that inhibit caspases.